Potatoes and rice are high in carbs, nearly fat-free and low in protein. Potatoes and rice both are relatively healthy in their pure, whole form. Each has its own nutritional profile. Unfortunately, both can go through extensive processing, causing them to lose nutritional power. Some dog foods use potato or rice byproducts, along with rice and potato items deemed unfit for human consumption. 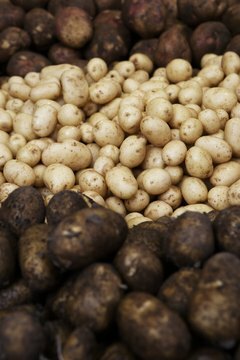 In their natural state, potatoes and rice are healthy complex carbohydrates, starches. Once refined into white rice or other processed versions, they lose vitamins, minerals and fiber. Their nutritional status in dog food depends on what form the food employs. For example, a dog food made with whole potatoes or brown rice is more nutritionally complete than a dog food made with white rice or byproducts such as potato skins or rice hulls. Look closely at labels to determine one from another. Potatoes and rice are both almost fat-free. Protein content is low, at 3 grams per cup for potatoes and 4 to 4.5 grams for rice. Fiber content is similar for potatoes and brown rice. A medium-size potato has about 3 grams of fiber; brown rice has 3.5 grams of fiber per cup. White rice only has 0.6. White rice is inferior nutritionally due to removal of all but the white interior of the grain. 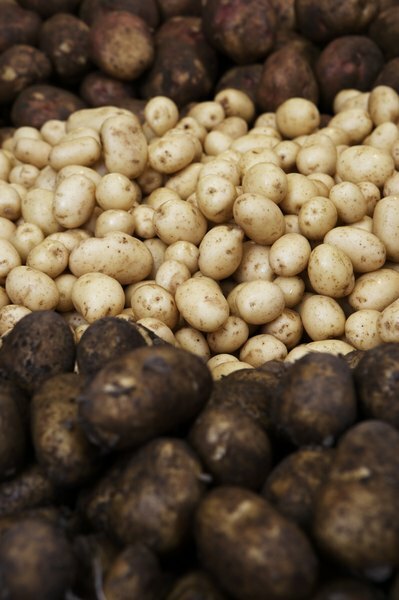 Because they grow underground, potatoes are richer in minerals than rice, offering potassium, phosphorous, magnesium, chromium, calcium, zinc and iron. Potatoes are good sources of vitamin C and several B vitamins. Rice is rich in B vitamins and a small amount of vitamin C. Many commercial dog foods are supplemented with vitamins and minerals; some do not. If not, or if you're cooking homemade food, both potatoes and rice can provide own individual vitamin and mineral contributions. Seek your veterinarian's input to fine-tune the diet, and consult the vet any time you change your pets' diet. Avoid nonspecific or processed ingredients like potato byproducts, along with rice hulls; these are fibrous, outer layers of rice, an all-but-inedible waste product in rice manufacturing. Arsenic has been found in rice -- and, despite its superior nutritional profile, brown rice contains more arsenic than white rice. Arsenic accumulates in the body, potentially causing nausea, vomiting and diarrhea, or death if exposure is great enough. The Maryland Department of the Environment states chronic exposure can cause cancer, skin outbreaks and nervous system changes. Do Cats Need More Food When it Gets Cold?